The eNotes Blog: How Is Shakespeare Still Relevant 400 Years After His Death? Tell Us…And Win $400! How Is Shakespeare Still Relevant 400 Years After His Death? Tell Us…And Win $400! 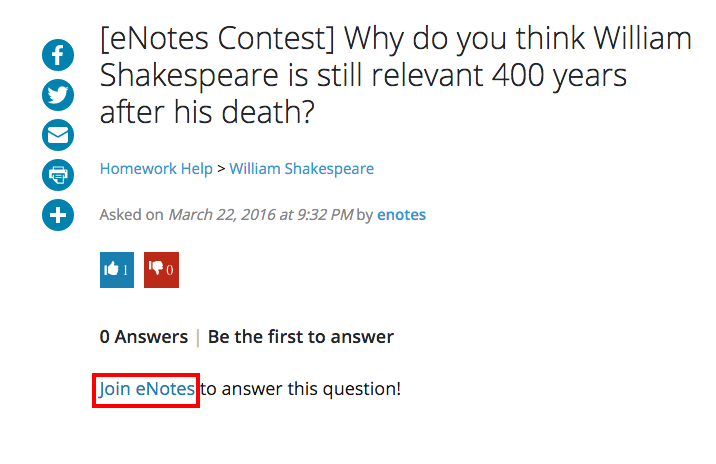 Without William Shakespeare, it is likely that eNotes.com would not exist—and what a sad world that would be! We started out ten years ago as purely a Shakespeare site, and over the years have added thousands of other authors, tens of thousands of book summaries and analyses, and new services like our rapidly-growing Homework Help. eNotes Homework Help is one of the most exciting services for students that we’ve created. Students can ask any question (on any subject) and get connected with one of our specialized educators to receive help on their toughest homework problems. With this service, we are helping to foster students’ critical thinking and are providing deeper understanding and contextual knowledge of the subject matter, whatever it may be. Since launching this service, we’ve answered over 300,000 questions and have helped millions of students! Shakespeare being the foundational bloodline of all of eNotes is just one of the ways we still find him relevant—even 400 years after his death. His works form the basis for some of our most popular pages and Homework Help answers to this day, for students and teachers alike. Now, we want to hear from you why you think Shakespeare is still relevant. It can be anything from how you relate to him, how his works inspire you, or something totally different (and off-the-wall!). We’re giving away some fantastic prizes, so read on about how to enter below! Tell us why you think Shakespeare is still relevant to literature, history, education, or…even just to you! 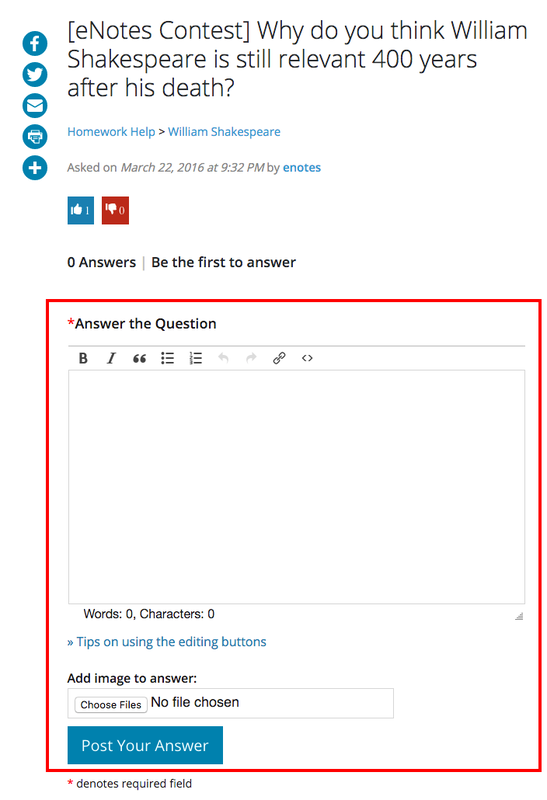 Your submission must be posted as an answer to our Homework Help question, which can be found by clicking the button below. Need help finding the answer box? Check out this screenshot if you are new to eNotes or this one if you are already logged in. Submissions are accepted until April 17, 2016 at 11:59 p.m. PST. Please note: be sure your eNotes account is up-to-date with the best email at which to reach you—this is how we will contact you if you win. We will select a grand prize winner to receive $400 cash, a 1-year eNotes subscription, and 100 credits to use in Homework Help (a $549.99 value!). Five (5) runner-ups will receive 50 credits to use in eNotes Homework Help. Selection will be based upon what our editors and users find to be the most interesting, helpful, funny, relatable, and in general all-around-awesome answers! If you have any questions, please send an email to dispatch@enotes.com and we will get back to you within 1-2 business days. We look forward to reading your entries. Best of luck!